Experiments to determine whether or not the whole antibody molecule is necessary for neutralization were made possible by digestion with the proteolytic enzymes pepsin, which releases the Fc region leaving an F(ab)2 structure, or papain, which results in a monovalent antigen-binding fragment (Fab). Most data relate to IgG. Some work suggests that F(ab)2 is not as efficient at neutralizing as the whole IgG (poliovirus, Keller 1966; R17 phage, Klinman et al. 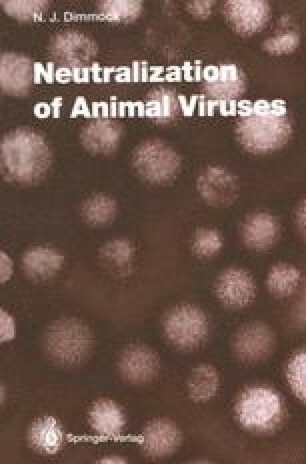 1967; visna virus, Jolly et al. 1989) or does not neutralize at all (adenovirus, Kjellen 1965a). However, F(ab)2 made from monoclonal IgG showed no reduction of neutralization (VEEV, Mathews et al. 1985; influenza virus HA, R.J. Rigg and N.J. Dimmock, unpublished data). Coversely, F(ab)2 to Semliki forest virus neutralized 100-fold more poorly than whole IgG (Boere et al. 1985). This is difficult to explain unless interaction of Fc regions with amino acid residues of the antigen which is a factor in precipitation by antibody (Steensgaard 1984) is important in neutralization of Semliki forest virus by this mab. Obviously F(ab)2 cannot carry out those activities which depend on signals integral to the Fc region such as binding to cellular Fc receptors or to complement, but F(ab)2 to RSV reduced lung virus titres in cotton rats by 100-fold (PRINCE et al. 1990).